BBM announced three new sets on their website yesterday - team sets for the Lions and Giants and this year's 2nd Version set. The Lions team set is a 99 card set sold in packs. There are 71 cards for the players, manager and coaches, a checklist card, a five card "Lion Slugger" subset, a four card "Lion Generation" subset, a nine card "Lion Crossing" subset, a three card "Lion Hurlers" subset and six cards for the 20th Anniversary "Cross Stream" cross-set subset. There's a nine card "Lion Dance" insert set and possible autograph cards (including 3-D ones). There's also some sort of parallel issue for the player, cross stream and "Lion Dance" cards. 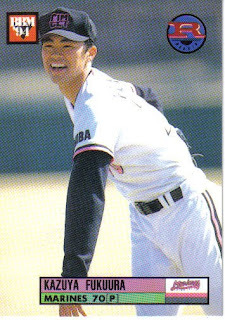 I don't know for sure, but I suspect that there will be several Yusei Kikuchi cards. The set will be released in mid-July. The Giants team set will be the largest of any of this year's team sets - 141 cards. There are 84 cards for the players, coach and manager (with FIVE different parallel issues). The set also includes a card for the mascot (or mascots), a checklist card, a four card Opening Game Highlights subset, a nine card "continuous photo" subset, a nine card "Future Star" subset, a 27(!) 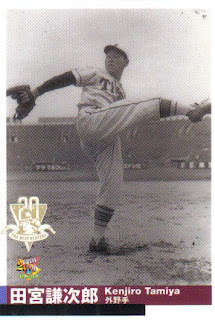 card subset entitled "GIANTS PRIDE 2010" and the six card "Cross Stream" cross-set subset. There are parallel versions of the "GIANTS PRIDE 2010" and "Cross Stream" subsets. 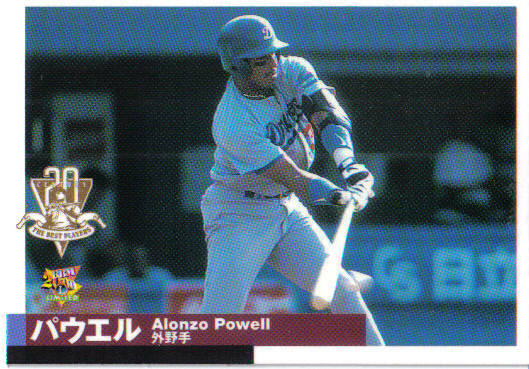 There's two insert sets - a 10 card one that I think are some sort of combination card (showing two players) and a "Giants Pride" set (not sure how many cards in this set) and a couple of possible autograph cards. The set will be on shelves in early July. With these two sets, the sole remaining team set that has not been announced yet is for the Dragons (unless I've somehow missed it). BBM hasn't released all the details for the 2nd Version set yet, but they listed most of them. There will be 216 "regular" player cards - 18 per team. 72 of these cards (six per team) will have various parallel versions - silver signature, gold signature, holo foil and red foil. There will be a 36 card 1st Version update subset - I don't think that this means that there will be 3 cards per team. There is a 12 card "Best Pitcher" and a 12 card "Strongest Combination" (both feature 1 card per team) and 12 team checklists. There's 36 cards for the "Cross Stream" cross-set subset (and this is three per team). (The "Strongest Combination" and "Cross Stream" subsets have parallel versions.) And finally, there is a subset for first pitch ceremonies - BBM has not announced the number of cards in the subset yet. I'm hoping for a Randy Johnson card. 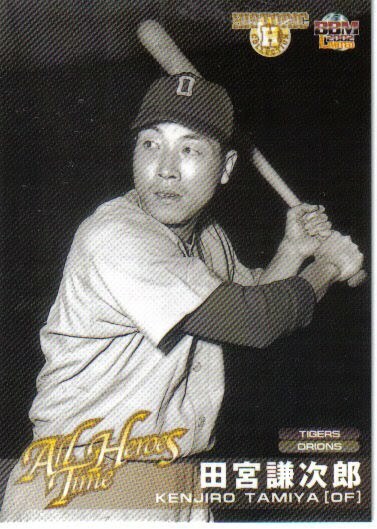 There's only one insert set - a 12 card "Hit Makers" set (yet again, one card per team). There are also possible memorabilia cards - if I'm translating things right, they are patch cards for prominent rookies (so I'd expect a Yusei Kikuchi one). The cards will be released in early August. This was a kind of odd item that BBM put up on their website last week: a box set for Eagles pitcher Masahiro Tanaka. 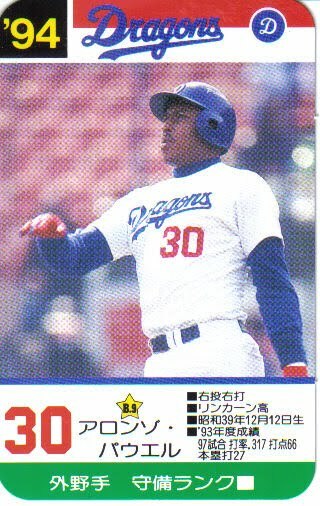 Now, BBM has done box sets for specific players before, but they've all been either for players or managers who are retiring (Atsuya Furuta, Kazuhiro Kiyohara, Shigeo Nagashima, Sadaharo Oh, and Norihiro Akahoshi for example) or coming to America (Hideki Matsui and Masumi Kuwata). (OK, last summer's Masaichi Kaneda set doesn't fit into either of those...) But this is the first time they've done a set for an active player. The set has 27 "regular" cards plus an insert card that could be a 3D card, an autographed card or a foil autographed card. The set will be released in mid-June. 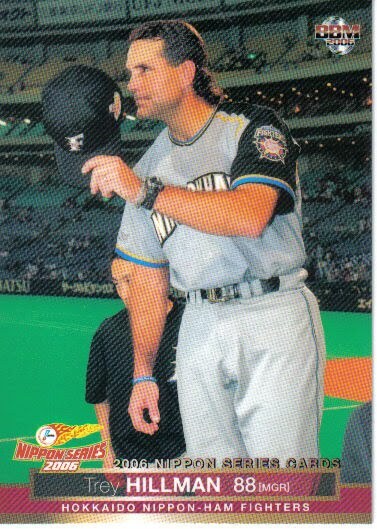 Yesterday, former Fighters manager Trey Hillman became a former Royals manager. 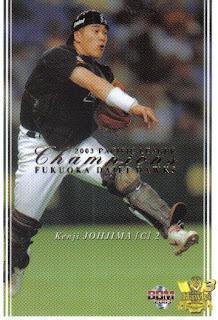 Here's a card from a better day in Hillman's career - from the BBM set commemorating the 2006 Nippon Series (#S01) - a Series won by Hillman's Fighters over the Chunichi Dragons. 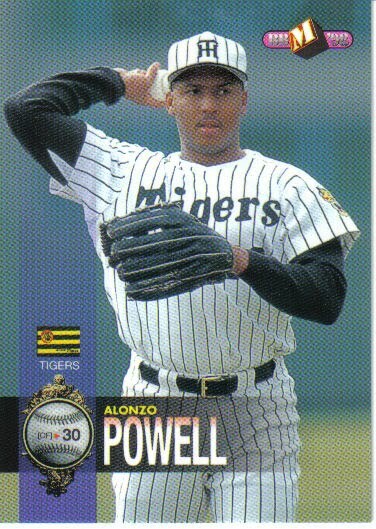 The Mariners promoted former Dragon and Tiger Alonzo Powell from being hitting coach at AAA Tacoma to being hitting coach for the big league club over the weekend. 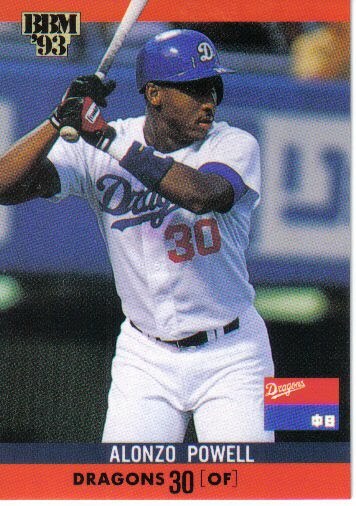 Powell played for the Dragons from mid-1992 through 1997. After Chunichi released him, he was picked up by Hanshin for the 1998 season, but they released him midway through the season. 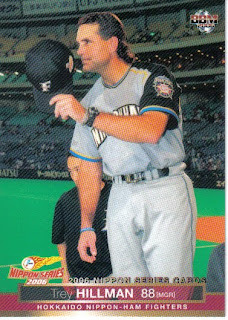 He was the first foreigner to win three consecutive Central League Batting titles (1994-96). 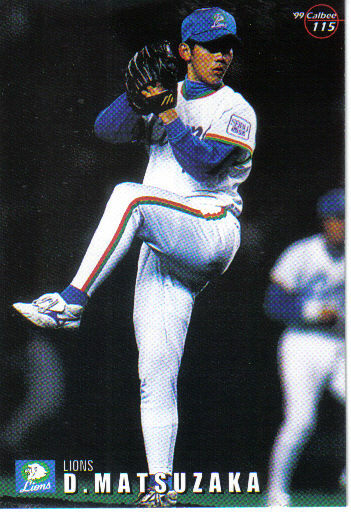 He was named to the Best 9 team four times (1993-96) and made the All Star team twice (1994 and 1996). He was also named as one of the 120 greatest 20th Century players by BBM in 2000. Powell was one of the players Rob Fitts interviewed in his oral history "Remembering Japanese Baseball". 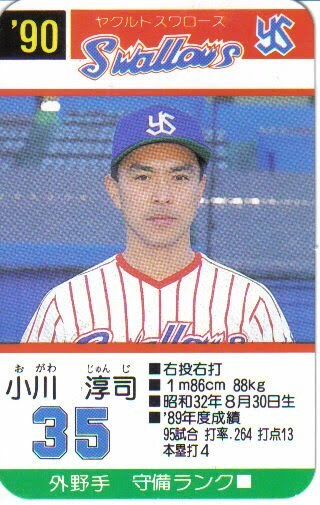 Last week, the checklist for 2010 Calbee Series 2 went up on Calbee's website. The "regular" set contains 96 cards (number 97-192 in continuation of Series 1) - eight cards per team. There is some overlap between the players included in Series 1 and the players included in Series 2, but they are not identical lists. Series 2 also contains a couple insert sets. There's an "Opening Day Player" (OP) set featuring 12 players who were in their team's Opening Day lineup (one for each team). There's a "Team Manager" (TM) set that (obviously) contains a card for each team's manager. There are four checklist cards that feature game highlights from the early part of the season. There's a 24 card "Star Card" set featuring two stars from each team and a 12 card "Hits Leader" (HL) set that features a leading hitter from each team and is apparently only available through some sort of redemption. The cards will be released on June 14. Last week, BBM put up information on their website for the latest 2010 team sets - the Marines and the Hawks. 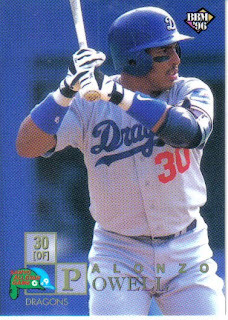 The Marines set is a pack based set containing 99 cards (like almost every other 2010 team set). 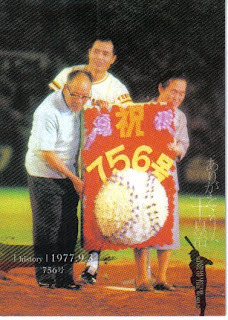 There are 77 cards for players, coaches and the manager, four checklist cards (showing the mascots, I think), three cards for rookies (I think again), three cards for guys chasing records, three cards for players who changed their uniform number, three cards showing the history of a couple uniform numbers, and the six card BBM 20th Anniversary "Cross Stream" cross-set subset. 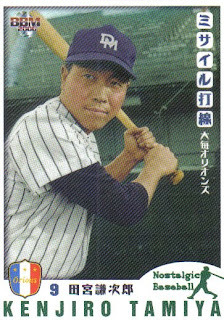 There's a nine card inset set ("key players") and (again I think) possible jersey and autograph cards from Yoshihisa Naruse, Tsuyoshi Nishioka and someone who I think is Tae-Kyun Kim. The set will be released in the middle of June. The Hawks set will also be 99 cards which will be broken down as 77 cards for players, coaches and manager, one checklist card, three cards for "SBM Victory", a nine card puzzle, three cards for "skyrocketing players" and six cards for the BBM 20th Anniversary cross-set subset. There's a nine card insert set (that I have no idea what the theme is) and possible jersey and autograph cards. Like the Marines set, this set will be out in mid-June. This brings the total number of team sets BBM has announced to nine. The only teams remaining are the Dragons, Lions and Giants. Baseball is President Eisenhower tossing out the first ball of the season; and a pudgy schoolboy playing catch with his dad on a Mississippi farm. Its the big league pitchers who sin in night clubs. And the Hollywood singer who pitches to the Giants in spring training. A tall, thin old man waving a scorecard from his dugout -- that's baseball. So is the big, fat guy with a bulbous nose running out one of his 714 home runs with mincing steps. It's America, this baseball. A re-issued newsreel of boyhood dreams. Dreams lost somewhere between boy and man. It's the Bronx cheer and the Baltimore farewell. The left-field screen in Boston, the right-field dump at Nashville's Sulphur Dell, the open stands in San Francisco, the dusty, wind-swept diamond at Albuquerque. And a rock home plate and a chicken wire backstop -- anywhere. There's a man in Mobile who remembers a triple he saw Honus Wagner hit in Pittsburgh 46 years ago. That's baseball. So is the scout reporting that a 16-year-old sandlot pitcher in Cheyenne is the new "Walter Johnson." It's a wizened little man shouting insults from the safety of his bleacher seat. And a big, smiling first baseman playfully tousling the hair of a youngster outside the players' gate. Baseball is a spirited race of man against man, reflex against reflex. A game of inches. Every skill is measured. Every heroic, every failing is seen and cheered -- or booed. And then becomes a statistic. In baseball, democracy shines its clearest. Here the only race that matters is the race to the bag. The creed is the rule book. Color is something to distinguish one team's uniform from another. Baseball is Sir Alexander Fleming, discoverer of penicillin, asking his Brooklyn hosts to explain Dodger signals. It's player Moe Berg speaking seven languages and working crossword puzzles in Sanskrit. It's a scramble in the box seats for a foul -- and a $125 suit ruined. A man barking into a hot microphone about a cool beer, that's baseball. So is the sportswriter telling a .383 hitter how to stride, and a 20-victory pitcher trying to write his impressions of the World Series. Baseball is a ballet without music. Drama without words. A carnival without kewpie dolls. A housewife in California couldn't tell you the color of her husband's eyes, but she knows that Yogi Berra is hitting .337, has brown eyes and used to love to eat bananas with mustard. That's baseball. So is the bright sanctity of Cooperstown's Hall of Fame. And the former big leaguer, who is playing out the string in a Class B loop. Baseball is continuity. Pitch to pitch. Inning to inning. Game to game. Series to series. Season to season. It's rain, rain, rain splattering on a puddled tarpaulin as thousands sit in damp disappointment. And the click of typewriters and telegraph keys in the press box -- like so many awakened crickets. Baseball is a cocky batboy. The old-timer whose batting average increases every time he tells it. A lady celebrating a home team rally by mauling her husband with a rolled-up scorecard. Baseball is the cool, clear eyes of Rogers Hornsby, the flashing spikes of Ty Cobb, an overaged pixie named Rabbit Maranville, and Jackie Robinson testifying before a Congressional hearing. Baseball? It's just a game -- as simple as a ball and a bat. Yet, as complex as the American spirit it symbolizes. It's a sport, business -- and sometimes even religion. Baseball is Tradition in flannel knickerbockers. And Chagrin in being picked off base. It is Dignity in the blue serge of an umpire running the game by rule of thumb. It is Humor, holding its sides when an errant puppy eludes two groundskeepers and the fastest outfielder. And Pathos, dragging itself off the field after being knocked from the box. Nicknames are baseball. Names like Zeke and Pie and Kiki and Home Run and Cracker and Dizzy and Dazzy. Baseball is a sweaty, steaming dressing room where hopes and feelings are as naked as the men themselves. It's a dugout with spike-scarred flooring. And shadows across an empty ballpark. It's the endless list of names in box scores, abbreviated almost beyond recognition. The holdout is baseball, too. He wants 55 grand or he won't turn a muscle. But, it's also the youngster who hitch-hikes from South Dakota to Florida just for a tryout. Arguments, Casey at the Bat, old cigarette cards, photographs, Take Me Out to the Ball Game -- all of them are baseball. Baseball is a rookie -- his experience no bigger than the lump in his throat -- trying to begin fulfillment of a dream. It's a veteran, too -- a tired old man of 35, hoping his aching muscles can drag him through another sweltering August and September. For nine innings, baseball is the story of David and Goliath, of Samson, Cinderella, Paul Bunyan, Homer's Iliad and the Count of Monte Cristo. Willie Mays making a brilliant World Series catch. And then going home to Harlem to play stick-ball in the street with his teen-age pals -- that's baseball. And so is the husky voice of a doomed Lou Gehrig saying, "I consider myself the luckiest man on the face of this earth." Baseball is cigar smoke, hot-roasted peanuts, The Sporting News, winter trades, "Down in Front," and the "Seventh-Inning Stretch." Sore arms, broken bats, a no-hitter, and the strains of the Star-Spangled Banner. Baseball is a highly paid Brooklyn catcher telling the nation's business leaders: "You have to be a man to be a big leaguer, but you have to have a lot of little boy in you, too." This is a game for America, this baseball! Are there legendary radio broadcasters in Japan? There must be, but I don't think I've ever heard of them. A couple of months ago, NPB signed a partnership with Coca-Cola Japan. One of the results of this partnership (other than the baseball cards being given away with Georgia coffee drinks) is a new award - the Georgia Spirit award. Every two weeks, six plays are selected by a group of judges that (in their view) most helped a team win. The fans then vote on those six plays.